Winnipeg will continue to see seasonably mild temperatures until a cold front moves through on Saturday evening. Winnipeg will continue to see seasonably warm temperatures today with light southerly winds. There may be a few fog patches around this morning, but those will burn off as the sun rises. The city should see a high near +5°C, but like the past couple days, temperatures may climb several degrees higher than that in areas where more of the snow has melted away. After any morning fog burns off, the city will see mainly sunny skies. Temperatures will cool down to around -7°C tonight with another chance for a few overnight clouds or fog patches. More warm weather is on the way for Saturday, too! More warm air will spread across the province by a powerful storm system moving across Hudson Bay. 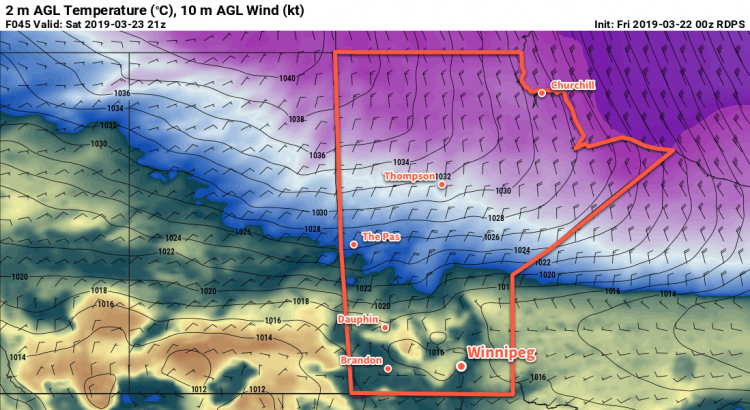 Winnipeg will see highs climb up to around 6 or 7°C but – broken record here – areas of the city with less snow could see temperatures climb into the double digits. Winds will be a bit more noticeable, though, out of the south-southwest at 20 km/h. Skies should start out mainly sunny, but the city may see partly cloudy skies develop in the afternoon. A slight cool-down arrives on Saturday evening as a cold front slumps southwards through the region. It will bring some cloud, a chance of flurries, and northeasterly winds of 30 to 40 km/h. Temperatures will cool to a low near -6°C on Saturday night. Sunday will bring sub-zero daytime highs back to the city…but just barely. Under clearing skies, Winnipeg will see temperatures climb to a high near -2°C with those northeasterly winds persisting into the afternoon. The wind will ease in the evening followed by temperatures cooling to a low near -11°C. Warm weather returns next week with another surge of mild Pacific air. Unlike the upper ridge which dominated the region this week and kept skies clear, a more unsettled pattern is forecast. This will result in variable cloudiness with a few chances for precipitation through the week. That said, no major precipitation events look to be on tap for the region, so favourable melt conditions look like they’ll continue. Today’s seasonal daytime high in Winnipeg is +1°C while the seasonal overnight low is -9°C.